Mendeley is a reference management program that allows you to organize, tag, and annotate documents, create reference citations, and share your findings with others. The desk top application also lets you highlight and annotate documents in your library, providing a handy set of tools. You also can identify a “watched folder” (for example, a DropBox folder), which will port any items placed in that folder to your Mendeley library for later sorting. A video summary of Mendeley’s capabilities is provided here. A more detailed look at library creation can be viewed in the video below. If you do any serious research, Mendeley is an extremely useful tool for organizing documents, and importantly, for finding them again later. The full-text search tool allows you to quickly find items on your own library or in the public group pages. Find trending topics by looking at the most widely read papers in your field. As noted, you can also use Mendeley’s annotation features to highlight and annotate research papers you find. 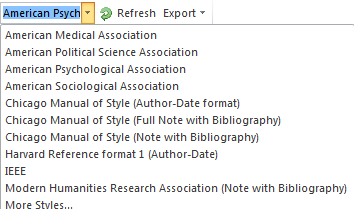 When you’re ready to write a research paper, the WORD add-on lets you insert citations and bibliographies using a variety of citation styles as shown below. You will need to proof your citations and bibliography, but having the head start is quite a time saver. Finally, the social features of Mendeley make it easy to connect with others in your field to share findings. Don’t see a group you like? Create your own group based on your research interests. Mendeley is a great way to expand your personal knowledge management (PKM) system and personal learning network (PLN) at the same time.